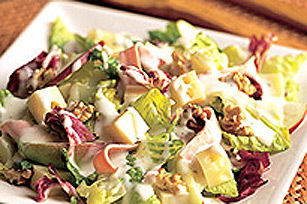 Top crisp salad greens with apples, walnuts, ham, Swiss cheese and a drizzle of ranch dressing for a super main dish salad. Your taste buds will thank you. Place washed and torn salad greens on a large plate or platter. Top greens with 2 sliced apples, toasted walnuts, 1 pkg. sliced ham cut into strips, and cubed Kraft Swiss Cheese. Drizzle salad with Kraft Ranch Dressing just before serving.